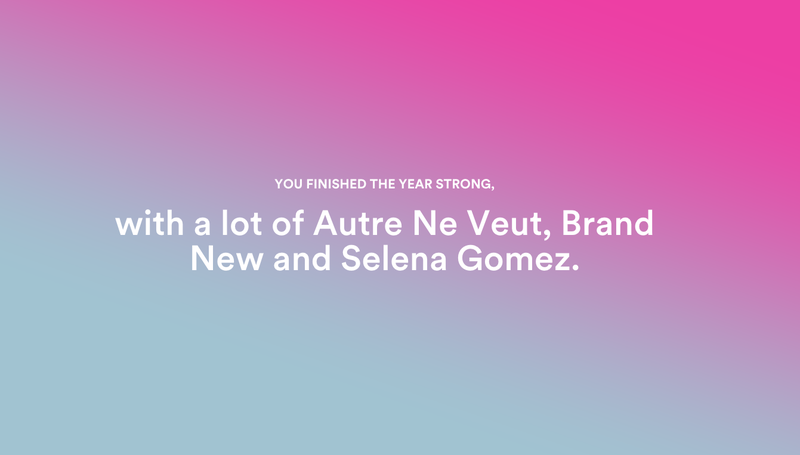 What's the Most Embarrassing Thing From Your Spotify Year in Music? When you survey your year in terms of industry-decimating streaming applications—you can see your most-streamed tracks, albums, and artists, and sort your habits by season, even—a lot of buried truth emerges. My truth, which I am currently living, is that I listened a lot this fall to (1) an album I’m still in love with, (2) an album with one perfect single, and (3) my favorite album of sophomore year of high school, which is, of course, Deja Entendu. Did I spend all year alternately burying my feelings and then expressing them through getting extremely torqued on dog walks listening to Brand New? Maybe. Either way, that’s for me to spend some personal time thinking about later, while I listen to Brand New.